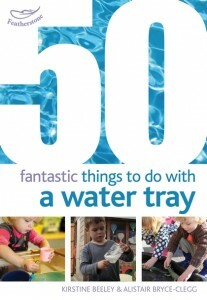 Packed full of inspiring activities which re-invigorate and extend traditional areas of early years provision, 50 Fantastic Things to do with a water tray, one of a series of four books, is a must have for pre-schools and nurseries. Each activity features easy to follow step-by-step instructions with additional ideas on how to extend the activity inside and outdoors. The learning possibilities are clearly identified and practitioners can see at a glance what the children will get out of the activity.